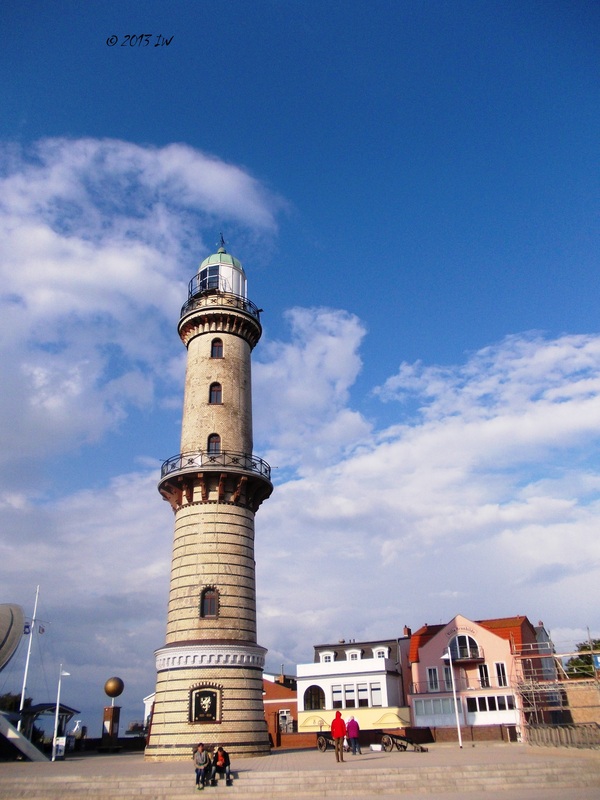 From Rostock you can go to Warnemünde in less than 30 minutes with the regular S-Bahn. As I considered my mission accomplished I wanted to go to the see and feel the sand under my sport shoes. I have an unusual relationship with the sea. I don't know to swim and as a kid, during my holidays with my parents, I was getting extremely bored of spending more than 30 minutes at the beach. And I rarely get a proper suntan. However, I love to be as often as possible near the sea or the Ocean. I like to know that wherever I want, I can have a look at the waves and look at the sun going up and down in the sea. My biggest love is the Mediterranean, but when nothing else left, I am happy to meet other nice seas as well. The decision to go to the Baltic was spontaneous, but prompted by a desperate pessimist thought that my travels will not bring me soon near a beloved sea. I needed my portion of water for the current season. When we arrived, it was windy and almost raining. The place was stocked with people coming or going, mostly looking to a place to eat. The usual rush from the seaside resort was there, with the usual groups of tourists and their kids running erratically from a restaurant to another. This time, we were the observers. At every 10 meters it was a restaurant, a hotel or room renting opportunity and a shop. Many shops or coffee houses closed at 7 pm, but there were still many options left. From time to time, a big seagull was hanging on the tables, ignoring the tourists. On the beach, we saw later big ads warning not to feed them, but did not feel that they are that dangerous for the human dinners. Each place with its custom, isn't it? Big and small, more or less elegant boats were hanging in the port, most of them empty. In case that you don't have one, it is possible to rent a boat, for 1/2 hour or more. If not boating, biking can be an option, especially during the days when swimming or sun bathing is almost impossible (as the day we were there). In case that you simply want to have some entertainment, maybe the movie theatres are a good option. Otherwise, there it is not too much to do. The eating options are mostly based on fish-meals, and did not spotted any vegetarian opportunities. The prices are relatively high, from 9 to over 22 Euro for a meal. The cultural tourists can go to visit the 34 meter Leuchturm, with a special architecture that can be seen from a distance of 37 km. The promenade is bordered with statues, and from time to time street musicians are creating a special ambiance. 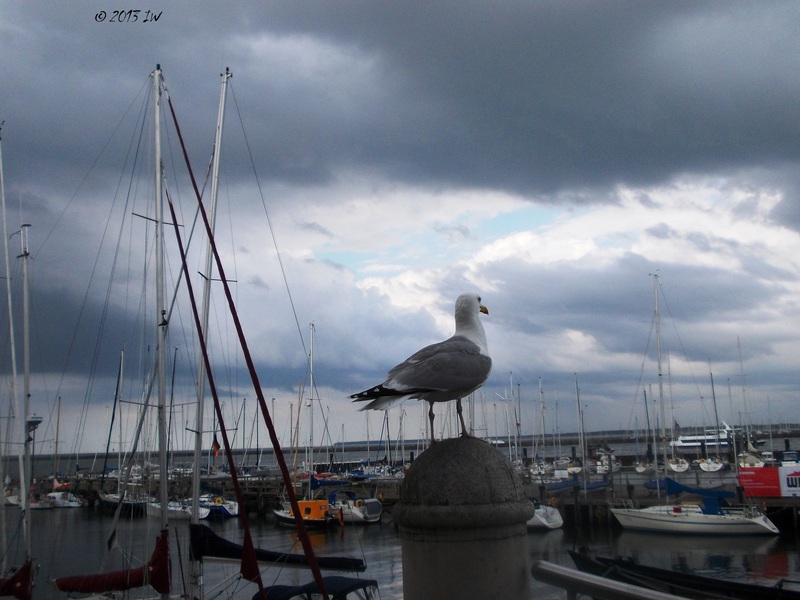 The place is too quiet for my taste and without too many action, but for someone looking to rest a visit to Rostock may be enough for one week at Warnemünde. The sea was shining, with some agitated waves, but the beach was almost empty, except some autumn-like dressed people at the beach bar, getting more warm around a glass of wine. One kid was trying to play with a kite and me happy to be at a real beach and walk on the sand. Just looking far away at the horizon line, I feel peace and optimism and that nothing else matters. Nothing else but my next trip, of course. Don't feed the seagulls! Only make a picture with them!